, a late English poet, was descended from a very ancient and respectable family, who are stated to have come into England with the Conqueror, and settled at a place called the Meerd in Herefordshire. His greatgreat-grandfather was auditor of the exchequer to James I. His son, sir Robert Pye, a knight also, married Anne, the eldest daughter of John Hampden, the patriot, of whom the subject of this article was consequently the representative by the female line. The last male heir left the estate in Herefordshire, and the name, to the Trevors, descended from the second daughter; but sir Robert Pye purchased Faringdon in Berkshire, which county he twice represented in Parliament. 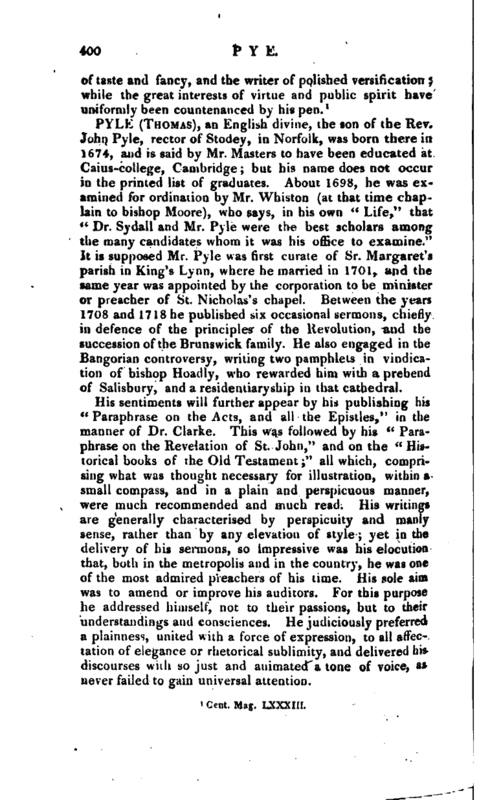 Our author’s father, Henry Pye, esq. who occasionally resided there, was elected no less than five times, without opposition, for the same county. Henry James Pye was born in London in 1745, and educated at home under a private tutor until he had attained the age of seventeen. He then entered a gentleman, commoner of Magdalen college, Oxford, under the care of Dr. Richard Scroup, where he continued four years, and had the honorary degree of M. A. conferred on him July 3, 1766. In 1772, at the installation of Lord North, he was also created Doctor of Laws. 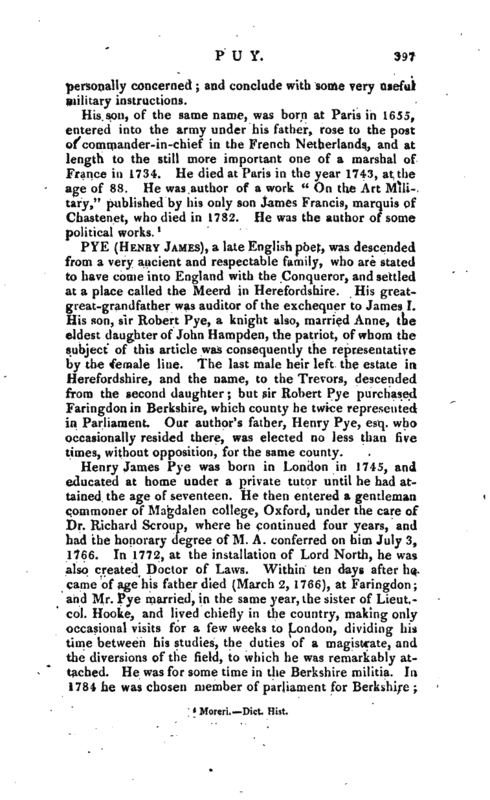 Within ten days after he came of age his father died (March 2, 1766), at Faringdon; and Mr. Pye married, in the same year, the sister of Lieut.­col. Hooke, and lived chiefly in the country, making only occasional visits for a few weeks to London, dividing his time between his studies, the duties of a magistrate, and the diversions of the field, to which he was remarkably attached. He was for some time in the Berkshire militia. In 1784 he was chosen member of parliament for Berkshire | but the numberless expences attending such a situation, and the contest to obtain it, reduced him to the harsh, yet necessary measure, of selling his paternal estate. In 179O Mr. Pye was appointed to succeed his ingenious and worthy friend Mr. Warton* as poet-laureat and in 1792 he was nominated one of the magistrates for Westminster, tinder the Police Act in both of which situations he conducted himself with honour and ability. From his earliest days Mr. Pye was devoted to reading. When he was about ten years old, his father put Pope’s Homer into his hand: the rapture which he received from this exquisite paraphrase of the Grecian bard was never to be forgotten, and it completely fixed him a rhymer for‘ life, as he pleasantly expressed it. To this early love of reading Mr. Pye was indebted for the various learning he possessed. His first literary production, probably, was an “Ode on the birth of the Prince of Wales,” published in the Oxford Collection and the following distinct publications have successively appeared from his prolific pen 1.“Beauty > a poetical essay,” 1766. 2. “’Elegies on different occasions,” 1768, 4to. 3. “The Triumph of Fashion, a vision,” 1771, 4to. 4. “Faringdon Hill, a poem in two books,” 1774, 4to. 5. 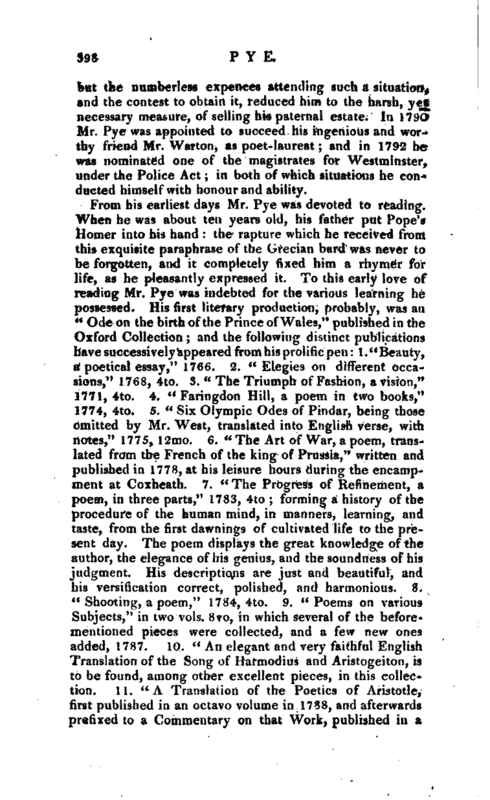 “Six Olympic Odes of Pindar, being those omitted by Mr. West, translated into English verse, with notes,” 1775, 12mo. 6. “The Art of War, a poem, translated from the French of the king of Prussia,” written and published in 1778, at his leisure hours during the encampment at Coxheath. 7. “The Progress of Refinement, a poem, in three parts,” 1783, 4to; forming a history of the procedure of the human mind, in manners, learning, and taste, from the first dawnings of cultivated life to the present day. The poem displays the great knowledge of the author, the elegance of his genius, and the soundness of his judgment. His descriptions are just and beautiful, and his versification correct, polished, and harmonious. 8. “Shooting, a poem,” 1784, 4to. 9. “Poems on various Subjects,” in two vols. 8vo, in which several of the beforementioned pieces were collected, and a few new ones added, 1787. 10. “An elegant and very faithful English Translation of the Song of Harmodius and Aristogeiton, is to be found, among other excellent pieces, in this collection. 11.” A Translation of the Poetics of Aristotle, first published in an octavo volume in 1788, and afterwards prefixed to a Commentary on that Work, published in a | quarto volume. 12. “Amusement, a poetical essay,” 1790. 13. “The Siege of Meaux, a tragedy, in three acts,” acted at Covent-Garden theatre, 1794, 8vo. 14. “The War Elegies of Tyrtseus imitated, and addressed to the people of Great Britain with some Observations on the Life and Poems of TyrtEeus,” 1795. 15. “The Democrat; interspersed with Anecdotes of well-known Characters,” 1795, 2 vols. 12mo. 16. “Lenore, a tale, translated from the German of Gottfried Augustus Burger,” 1796, 4to. Of the several translations of this tale which have appeared, Mr. Pye’s is esteemed the best but nei r ther English morals nor English taste are likely to be benefited by the translation of such poems as “Lenore.” 17. “Naucratia, or Naval dominion, a poem,” 2d edit. 1798. 18. “The Inquisitor, a tragedy in five acts, altered from the German by the late James Petit Andrews and Henry James Pye,” 1798, 8vo. 19. “The Aristocrat, by the author of the Democrat,” 1799, 2 vols. 12mo. 2O. “Carmen Seculare for the year 1800.” 21. “Adelaide, a tragedy,” acted at Drury-lane theatre, 1800, 8vo, but calculated rather for the closet than the stage. 22. “Alfred, an epic poem in six books,” 1802, 4to. 23. “Verses on several subjects, written in the vicinity of Stoke Park, in the summer and autumn of 1801,” 1802. sm. 8vo. 24. “A second Collection of his Poems, in two octavo volumes, comprising, besides several of those already mentioned, a volume of sketches on various subjects and a translation of Xenophon’s Defence of the Athenian Democracy, with, notes.” 25. “A Prior Claim, a comedy,” acted at Drurylane Theatre, 1805, 8vo, in which he was assisted by Mr. Samuel James Arnold, his son-in-law. 26. “Comments on the Commentators on Shakspeare with preliminary observations on his genius and writings, and on the labours of those who have endeavoured to elucidate them,”8O7 y 8vo. 27. “A Translation of the Hymns and Epigrams of Homer,” 1810. He published also many occasional poems, besides his odes for the new year, for his majesty’s birthday, and for the anniversary of the Literary Fund, which are preserved in the magazines. 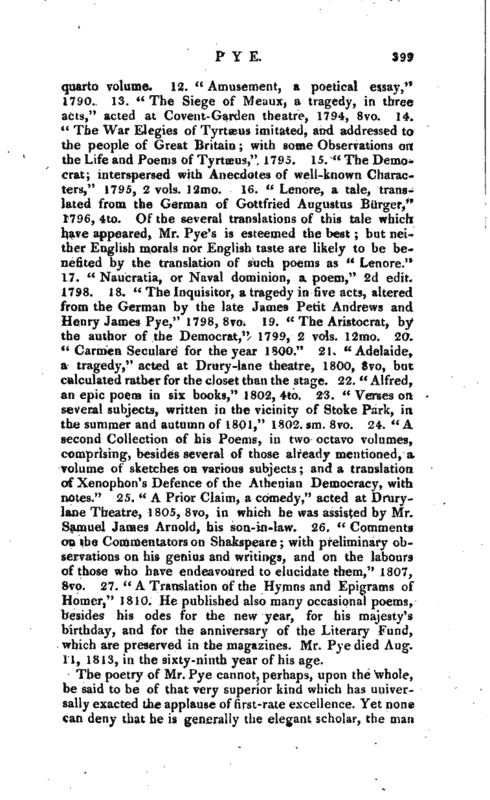 Mr. Pye died Aug. 11, 1813, in the sixty-ninth year of his age.